We’ve been reading Marshall Rosenberg’s book Nonviolent Communication, A Language of Life (it falls in the “I-wish-I’d-read-this-sooner!” category of books). In it, Rosenberg makes the point that anger is the response to a need that is not being filled. Let’s pause for a moment to let that sink in - anger is the response to a need that is not being filled. Isn’t that also what Compassion is? The difference, it seems to us, is that compassion is the response we turn toward when we understand that a need isn’t being fulfilled. Anger, on the other hand, indicates “that we have moved up to our head to analyze and judge somebody rather than focus on which of our needs are not getting met.” (Rosenberg). We’d say that anger is more of a reaction, than a response. 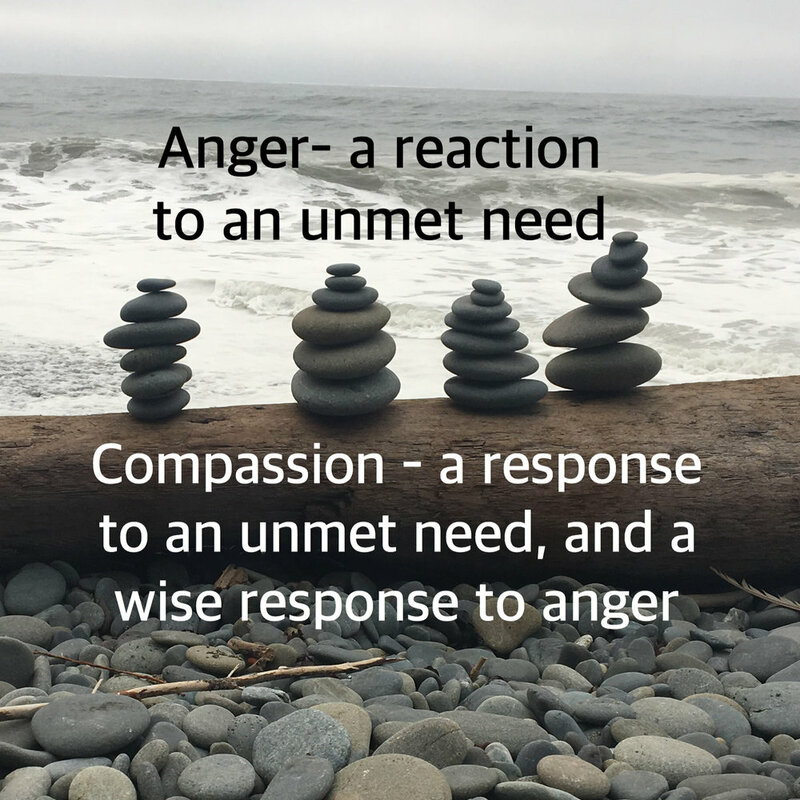 So anger, either our own or others’, is a golden opportunity to pause and examine which needs are going unmet, then to respond with compassion to the person feeling anger - whether it is ourselves or someone else - and figure out how to get those needs met. Using Anger as a trigger for Compassion, rather than Anger as a trigger for more Anger or Shame, takes work. Our own anger most often feels fully justified or “righteous”, but it’s really just cutting us off from our capacity to tend to our own unmet needs wisely. Others’ anger, particularly when directed at us, can lead us to feel judged, ashamed, or angry in our own right - again cutting us off from being able to meet the needs that are not being met. Learning what anger feels like in our body so we know when it’s present in us (Mindfulness of Emotions), building the ability to be present for ourselves or others in the heat of an uncomfortable moment (Equanimity) and developing the habitual response of moving toward wishing for needs to be met (Compassion) all support our ability to flip a moment from suffering and disconnection to wise action and connection. So we invite you this week, as you encounter instances of anger, to invoke a sense of curiosity about what needs aren’t being met and to see if compassion doesn’t create the opportunity for shared happiness. After all, as the saying goes, “Anger is like drinking poison and expecting the other person to get sick”.